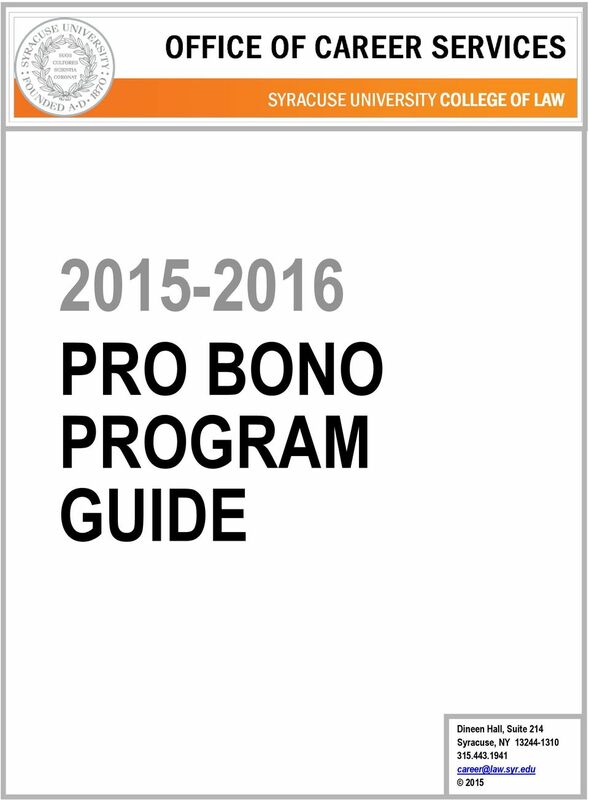 Download "2015-2016 PRO BONO PROGRAM GUIDE"
2 What is Pro Bono? The origin of word Pro Bono comes from the Latin phrase pro bono publico, which means for the public good. Pro Bono services are legal services performed by an attorney for free or for a substantially reduced fee to assist people with limited means. Syracuse Law s Pro Bono Program is designed to instill in each student the ethical responsibility that all attorneys hold to their communities and to educate students on their professional obligation to perform Pro Bono work. 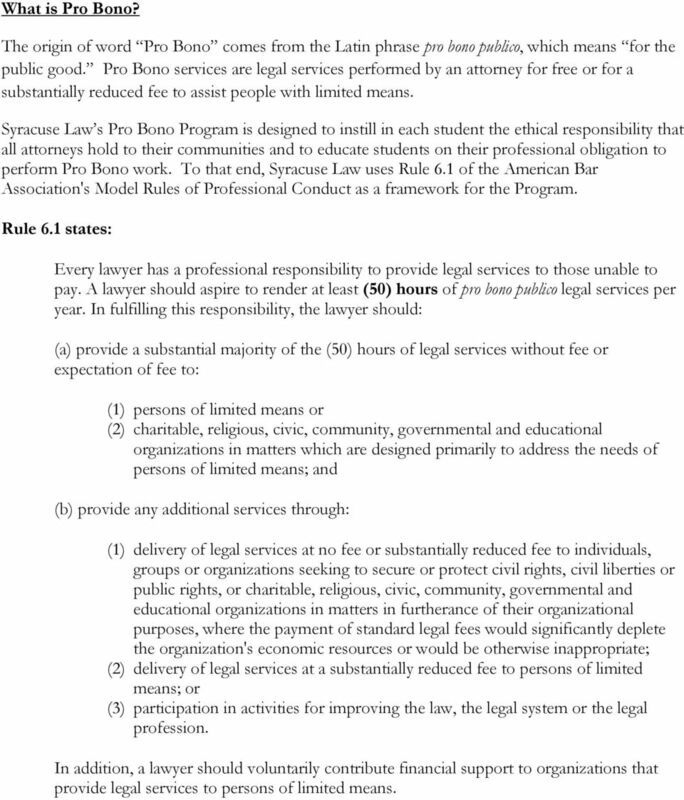 To that end, Syracuse Law uses Rule 6.1 of the American Bar Association's Model Rules of Professional Conduct as a framework for the Program. Rule 6.1 states: Every lawyer has a professional responsibility to provide legal services to those unable to pay. A lawyer should aspire to render at least (50) hours of pro bono publico legal services per year. In fulfilling this responsibility, the lawyer should: (a) provide a substantial majority of the (50) hours of legal services without fee or expectation of fee to: (1) persons of limited means or (2) charitable, religious, civic, community, governmental and educational organizations in matters which are designed primarily to address the needs of persons of limited means; and (b) provide any additional services through: (1) delivery of legal services at no fee or substantially reduced fee to individuals, groups or organizations seeking to secure or protect civil rights, civil liberties or public rights, or charitable, religious, civic, community, governmental and educational organizations in matters in furtherance of their organizational purposes, where the payment of standard legal fees would significantly deplete the organization's economic resources or would be otherwise inappropriate; (2) delivery of legal services at a substantially reduced fee to persons of limited means; or (3) participation in activities for improving the law, the legal system or the legal profession. In addition, a lawyer should voluntarily contribute financial support to organizations that provide legal services to persons of limited means. 3 Why do Pro Bono? The most compelling reason to engage in Pro Bono service is to assist with meeting the legal needs of millions of people who need assistance and cannot afford it. Although there are legal services that do provide representation, the need is far greater than the current services that are available. As a law student, Pro Bono work will provide you with an opportunity to enrich and further develop your legal education. Applying what you learn in the classroom to real life situations allows you to gain practical experience while improving your legal advocacy skills (problem solving, research and writing, client interviewing, etc.). Pro Bono service also exposes you to different areas of law and gives you an opportunity to network with attorneys in those areas who can mentor you and serve as future references. 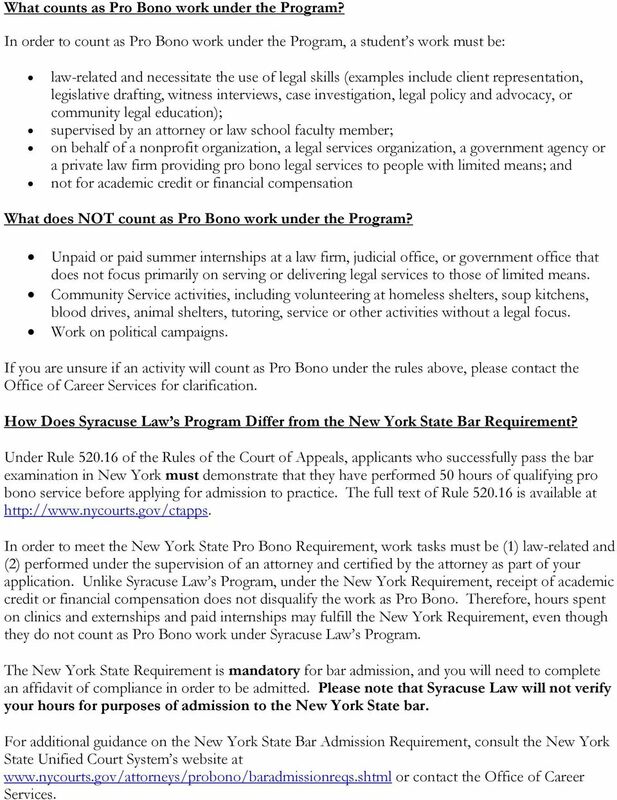 What is Syracuse Law s Pro Bono Program? 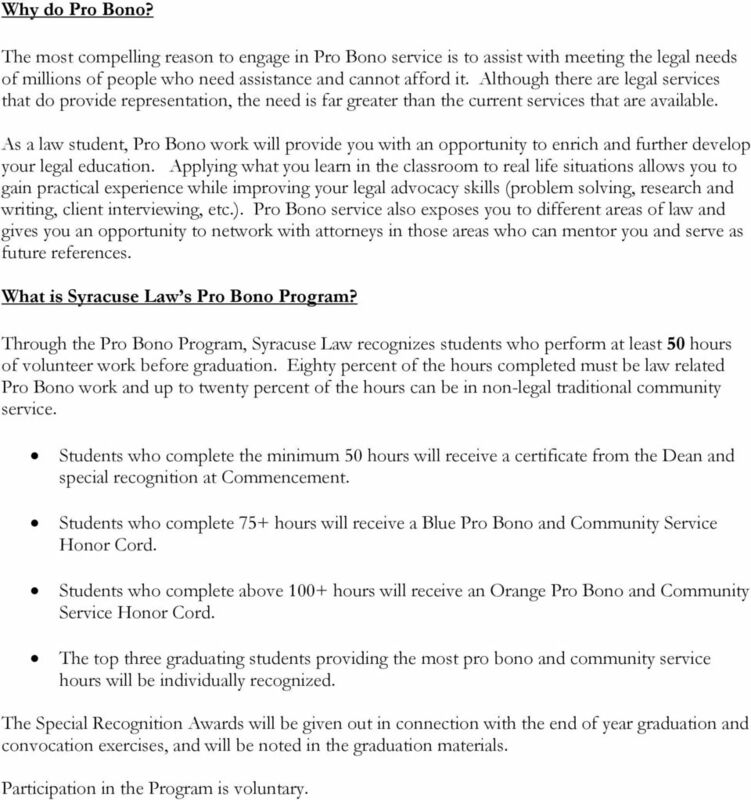 Through the Pro Bono Program, Syracuse Law recognizes students who perform at least 50 hours of volunteer work before graduation. Eighty percent of the hours completed must be law related Pro Bono work and up to twenty percent of the hours can be in non-legal traditional community service. Students who complete the minimum 50 hours will receive a certificate from the Dean and special recognition at Commencement. Students who complete 75+ hours will receive a Blue Pro Bono and Community Service Honor Cord. Students who complete above 100+ hours will receive an Orange Pro Bono and Community Service Honor Cord. The top three graduating students providing the most pro bono and community service hours will be individually recognized. The Special Recognition Awards will be given out in connection with the end of year graduation and convocation exercises, and will be noted in the graduation materials. Participation in the Program is voluntary. 4 What counts as Pro Bono work under the Program? In order to count as Pro Bono work under the Program, a student s work must be: law-related and necessitate the use of legal skills (examples include client representation, legislative drafting, witness interviews, case investigation, legal policy and advocacy, or community legal education); supervised by an attorney or law school faculty member; on behalf of a nonprofit organization, a legal services organization, a government agency or a private law firm providing pro bono legal services to people with limited means; and not for academic credit or financial compensation What does NOT count as Pro Bono work under the Program? Unpaid or paid summer internships at a law firm, judicial office, or government office that does not focus primarily on serving or delivering legal services to those of limited means. Community Service activities, including volunteering at homeless shelters, soup kitchens, blood drives, animal shelters, tutoring, service or other activities without a legal focus. Work on political campaigns. If you are unsure if an activity will count as Pro Bono under the rules above, please contact the Office of Career Services for clarification. How Does Syracuse Law s Program Differ from the New York State Bar Requirement? Under Rule of the Rules of the Court of Appeals, applicants who successfully pass the bar examination in New York must demonstrate that they have performed 50 hours of qualifying pro bono service before applying for admission to practice. The full text of Rule is available at In order to meet the New York State Pro Bono Requirement, work tasks must be (1) law-related and (2) performed under the supervision of an attorney and certified by the attorney as part of your application. Unlike Syracuse Law s Program, under the New York Requirement, receipt of academic credit or financial compensation does not disqualify the work as Pro Bono. Therefore, hours spent on clinics and externships and paid internships may fulfill the New York Requirement, even though they do not count as Pro Bono work under Syracuse Law s Program. The New York State Requirement is mandatory for bar admission, and you will need to complete an affidavit of compliance in order to be admitted. Please note that Syracuse Law will not verify your hours for purposes of admission to the New York State bar. For additional guidance on the New York State Bar Admission Requirement, consult the New York State Unified Court System s website at or contact the Office of Career Services. 5 Ethical and Professional Responsibility Students who participate in pro bono service projects (either sponsored by the College of Law or individually sought) should treat the placement and/ or assignment with the same level of professionalism that is expected at an internship or any other job placement. A clear understanding of all expectations and duties should be discussed prior to accepting any pro bono assignment. 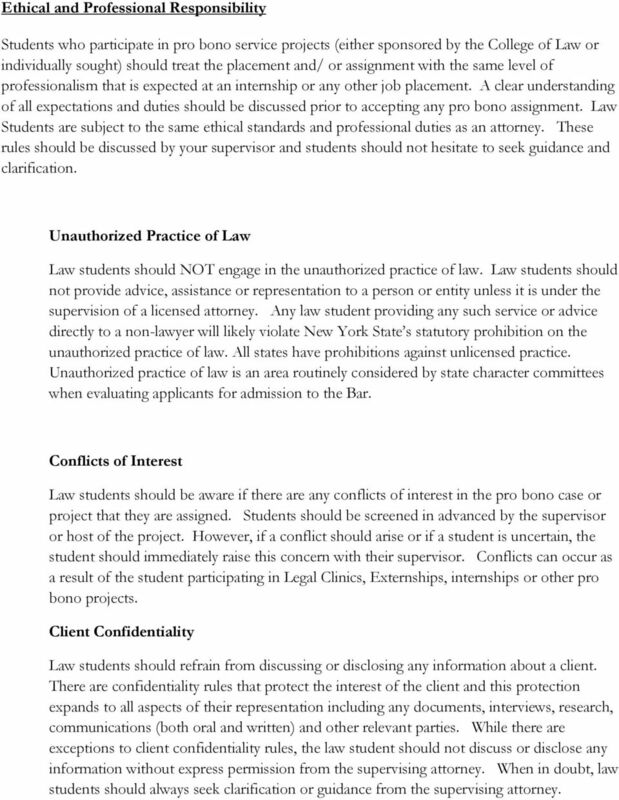 Law Students are subject to the same ethical standards and professional duties as an attorney. These rules should be discussed by your supervisor and students should not hesitate to seek guidance and clarification. Unauthorized Practice of Law Law students should NOT engage in the unauthorized practice of law. Law students should not provide advice, assistance or representation to a person or entity unless it is under the supervision of a licensed attorney. Any law student providing any such service or advice directly to a non-lawyer will likely violate New York State s statutory prohibition on the unauthorized practice of law. All states have prohibitions against unlicensed practice. Unauthorized practice of law is an area routinely considered by state character committees when evaluating applicants for admission to the Bar. Conflicts of Interest Law students should be aware if there are any conflicts of interest in the pro bono case or project that they are assigned. Students should be screened in advanced by the supervisor or host of the project. However, if a conflict should arise or if a student is uncertain, the student should immediately raise this concern with their supervisor. Conflicts can occur as a result of the student participating in Legal Clinics, Externships, internships or other pro bono projects. Client Confidentiality Law students should refrain from discussing or disclosing any information about a client. There are confidentiality rules that protect the interest of the client and this protection expands to all aspects of their representation including any documents, interviews, research, communications (both oral and written) and other relevant parties. While there are exceptions to client confidentiality rules, the law student should not discuss or disclose any information without express permission from the supervising attorney. When in doubt, law students should always seek clarification or guidance from the supervising attorney. 6 How do I find Pro Bono opportunities? 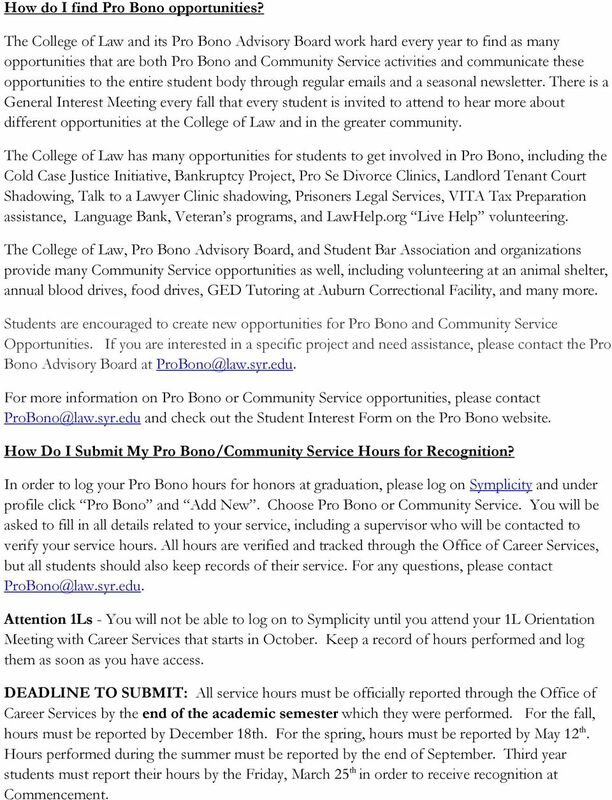 The College of Law and its Pro Bono Advisory Board work hard every year to find as many opportunities that are both Pro Bono and Community Service activities and communicate these opportunities to the entire student body through regular s and a seasonal newsletter. There is a General Interest Meeting every fall that every student is invited to attend to hear more about different opportunities at the College of Law and in the greater community. The College of Law has many opportunities for students to get involved in Pro Bono, including the Cold Case Justice Initiative, Bankruptcy Project, Pro Se Divorce Clinics, Landlord Tenant Court Shadowing, Talk to a Lawyer Clinic shadowing, Prisoners Legal Services, VITA Tax Preparation assistance, Language Bank, Veteran s programs, and LawHelp.org Live Help volunteering. The College of Law, Pro Bono Advisory Board, and Student Bar Association and organizations provide many Community Service opportunities as well, including volunteering at an animal shelter, annual blood drives, food drives, GED Tutoring at Auburn Correctional Facility, and many more. Students are encouraged to create new opportunities for Pro Bono and Community Service Opportunities. If you are interested in a specific project and need assistance, please contact the Pro Bono Advisory Board at For more information on Pro Bono or Community Service opportunities, please contact and check out the Student Interest Form on the Pro Bono website. How Do I Submit My Pro Bono/Community Service Hours for Recognition? In order to log your Pro Bono hours for honors at graduation, please log on Symplicity and under profile click Pro Bono and Add New. Choose Pro Bono or Community Service. You will be asked to fill in all details related to your service, including a supervisor who will be contacted to verify your service hours. All hours are verified and tracked through the Office of Career Services, but all students should also keep records of their service. For any questions, please contact Attention 1Ls - You will not be able to log on to Symplicity until you attend your 1L Orientation Meeting with Career Services that starts in October. Keep a record of hours performed and log them as soon as you have access. DEADLINE TO SUBMIT: All service hours must be officially reported through the Office of Career Services by the end of the academic semester which they were performed. For the fall, hours must be reported by December 18th. For the spring, hours must be reported by May 12 th. Hours performed during the summer must be reported by the end of September. Third year students must report their hours by the Friday, March 25 th in order to receive recognition at Commencement. 8 or two students will staff the clinic for the entire semester. Preference is given to 3Ls who have already completed some wills, trusts and estates classwork. Immigration Clinic Volunteer immigration attorneys provide in-depth immigration law advice and counsel to any low-income community members with immigration questions. Law students assist with intake and shadow during consultations. The clinic runs the first Tuesday of every month from 4pm-6pm Catholic Charities Refugee Resettlement Program in Syracuse. Ideally one law student will staff the project on a monthly basis for the whole semester. Veterans Clinic These are free drop in clinics that give Veterans the opportunity to seek general legal advice, information and referrals from experienced attorneys. Law students volunteers conduct intake and shadow the attorney during consultations. This is a particularly excellent opportunity for law students who have served in the armed forces themselves. The clinic runs the first Wednesday of every month from 6pm-7:30pm at the Syracuse Vet Center. 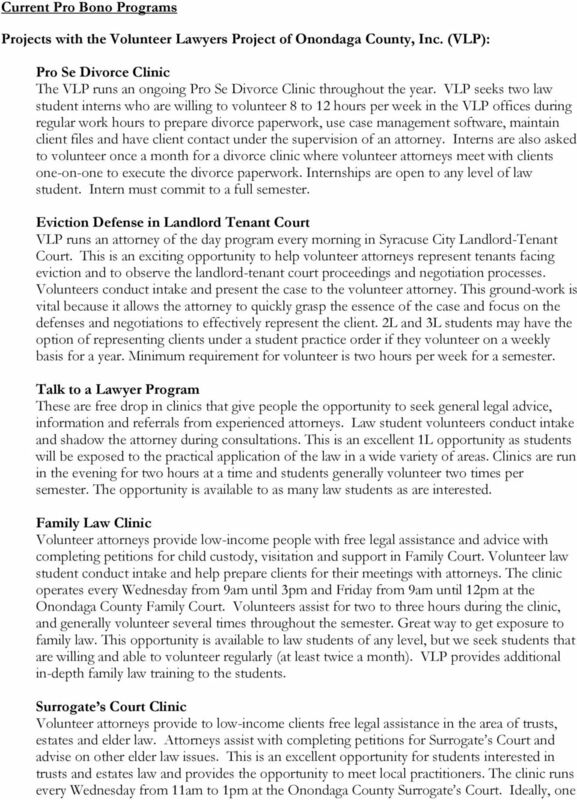 Students interested in volunteering with VLP should contact the Pro Bono Advisory Board at Participating in training for these programs is mandatory. Therefore, please look for the announcements regarding training as opportunities become available. 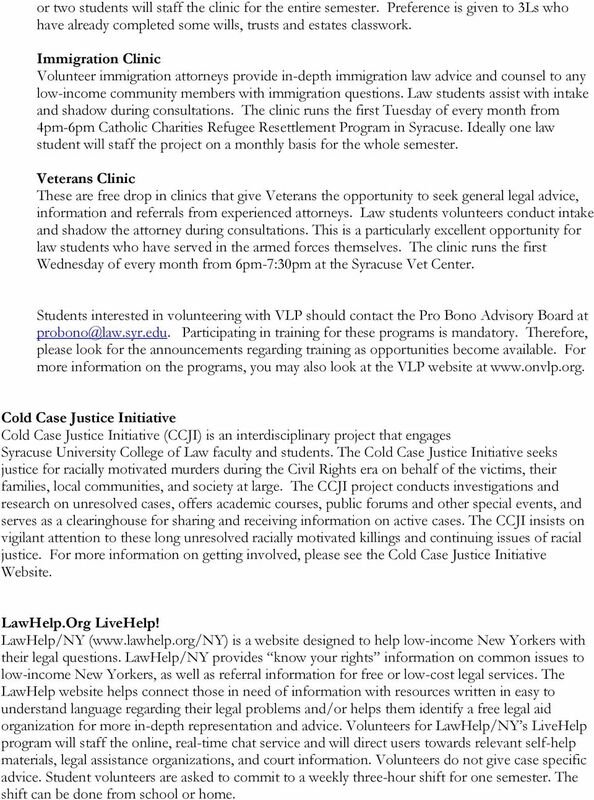 For more information on the programs, you may also look at the VLP website at Cold Case Justice Initiative Cold Case Justice Initiative (CCJI) is an interdisciplinary project that engages Syracuse University College of Law faculty and students. The Cold Case Justice Initiative seeks justice for racially motivated murders during the Civil Rights era on behalf of the victims, their families, local communities, and society at large. The CCJI project conducts investigations and research on unresolved cases, offers academic courses, public forums and other special events, and serves as a clearinghouse for sharing and receiving information on active cases. The CCJI insists on vigilant attention to these long unresolved racially motivated killings and continuing issues of racial justice. For more information on getting involved, please see the Cold Case Justice Initiative Website. LawHelp.Org LiveHelp! LawHelp/NY ( is a website designed to help low-income New Yorkers with their legal questions. LawHelp/NY provides know your rights information on common issues to low-income New Yorkers, as well as referral information for free or low-cost legal services. The LawHelp website helps connect those in need of information with resources written in easy to understand language regarding their legal problems and/or helps them identify a free legal aid organization for more in-depth representation and advice. Volunteers for LawHelp/NY s LiveHelp program will staff the online, real-time chat service and will direct users towards relevant self-help materials, legal assistance organizations, and court information. Volunteers do not give case specific advice. Student volunteers are asked to commit to a weekly three-hour shift for one semester. The shift can be done from school or home. 9 Community Service Opportunities Auburn Correctional Facility GED Tutoring The Auburn GED Tutoring Program is considering applications for volunteers to tutor for the school year. It s a great opportunity for students, faculty, and staff to get involved in social justice initiatives and a great choice for students interested in community engagement, criminal justice and education. Tutoring sessions are once per week and last from 5:30pm until later in the evening. If you re interested, please contact Brooke Koester at Language Bank Students that are fluent in a second language and are interested in working as a translator for attorneys representing indigent persons are encouraged to register for the Language Bank. Please contact with the language you speak and/or write and your level of fluency. Please note that this can turn into a Pro Bono opportunity if you are assisting the attorney with the representation of the client. However, general translation is not considered pro bono. 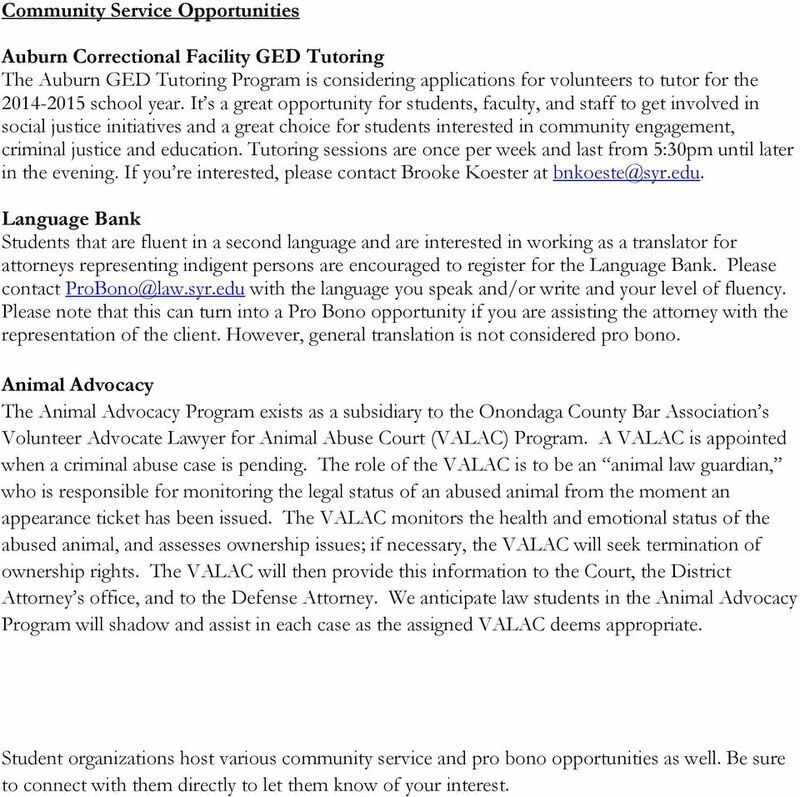 Animal Advocacy The Animal Advocacy Program exists as a subsidiary to the Onondaga County Bar Association s Volunteer Advocate Lawyer for Animal Abuse Court (VALAC) Program. A VALAC is appointed when a criminal abuse case is pending. The role of the VALAC is to be an animal law guardian, who is responsible for monitoring the legal status of an abused animal from the moment an appearance ticket has been issued. The VALAC monitors the health and emotional status of the abused animal, and assesses ownership issues; if necessary, the VALAC will seek termination of ownership rights. The VALAC will then provide this information to the Court, the District Attorney s office, and to the Defense Attorney. We anticipate law students in the Animal Advocacy Program will shadow and assist in each case as the assigned VALAC deems appropriate. Student organizations host various community service and pro bono opportunities as well. Be sure to connect with them directly to let them know of your interest. Revised 01 July 2014 REQUIREMENTS FOR THE JURIS DOCTOR (JD) DEGREE We offer four scheduling options: THE FOUR SCHEDULING OPTIONS 1. Full-Time Day (with classes scheduled between 8:00 am and 5:00 pm) 2. ISBA and the Unauthorized Practice of Law - What The Public Needs To Know. Comparison of Newly Adopted Utah Rules of Professional Conduct with ABA Model Rules UTAH Rules as adopted by Utah Supreme Court to be effective 11/1/05. Changes to Rules 1.12 and 2.4 effective 11/1/06. A Guide for the General Practitioner: Ethical Issues When Evaluating, Selecting and Handling Personal Injury Case I. B. This Code of Conduct applies only to employees over which the Board of Commissioners has supervisory authority.